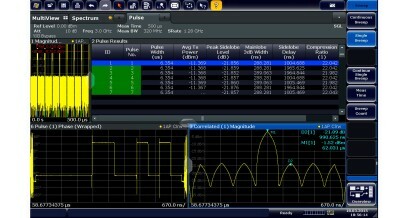 The R&S®FSW-K6 option can be upgraded with the R&S®FSW-K6S option to automatically measure the compression parameters of modulated pulses. Results such as the main lobe vs. side lobe level and the time differences between the main lobe and the side lobes are displayed in the results summary table. The user can upload reference pulse waveforms in I/Q format and compare phase and frequency within a pulse with the measured values.